Delaunay tesselation in N dimensions. Allow adding new points incrementally. This takes up some additional resources. Additional options to pass to Qhull. See Qhull manual for details. Option “Qt” is always enabled. Default:”Qbb Qc Qz Qx Q12” for ndim > 4 and “Qbb Qc Qz Q12” otherwise. Incremental mode omits “Qz”. Raised when Qhull encounters an error condition, such as geometrical degeneracy when options to resolve are not enabled. Raised if an incompatible array is given as input. The tesselation is computed using the Qhull library Qhull library. Unless you pass in the Qhull option “QJ”, Qhull does not guarantee that each input point appears as a vertex in the Delaunay triangulation. Omitted points are listed in the coplanar attribute. Note that depending on how rounding errors go, the simplices may be in a different order than above. The coordinates for the first point are all positive, meaning it is indeed inside the triangle. transform Affine transform from x to the barycentric coordinates c.
vertex_to_simplex Lookup array, from a vertex, to some simplex which it is a part of. convex_hull Vertices of facets forming the convex hull of the point set. vertex_neighbor_vertices Neighboring vertices of vertices. 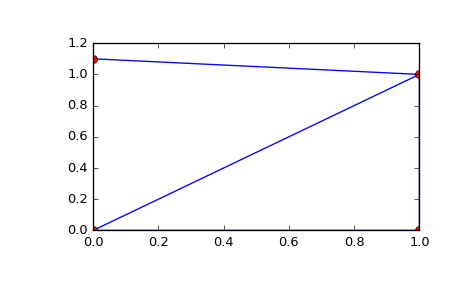 points (ndarray of double, shape (npoints, ndim)) Coordinates of input points. simplices (ndarray of ints, shape (nsimplex, ndim+1)) Indices of the points forming the simplices in the triangulation. For 2-D, the points are oriented counterclockwise. neighbors (ndarray of ints, shape (nsimplex, ndim+1)) Indices of neighbor simplices for each simplex. The kth neighbor is opposite to the kth vertex. For simplices at the boundary, -1 denotes no neighbor. equations (ndarray of double, shape (nsimplex, ndim+2)) [normal, offset] forming the hyperplane equation of the facet on the paraboloid (see Qhull documentation for more). paraboloid_scale, paraboloid_shift (float) Scale and shift for the extra paraboloid dimension (see Qhull documentation for more). vertices Same as simplices, but deprecated. add_points(points[, restart]) Process a set of additional new points. find_simplex(self, xi[, bruteforce, tol]) Find the simplices containing the given points. lift_points(self, x) Lift points to the Qhull paraboloid. plane_distance(self, xi) Compute hyperplane distances to the point xi from all simplices. © Copyright 2008-2016, The Scipy community. Last updated on Sep 19, 2016.